Mario Fenech is one of the most passionate and dedicated individuals to have ever played Rugby League. Mario continues to contribute to not only rugby league but also to the wider community. Mario had a 15-year playing career with the South Sydney Rabbitohs, the North Sydney Bears and the South Queensland Crushers. He also played for New South Wales in state of origin competition and for City in the City vs Country Origin match. 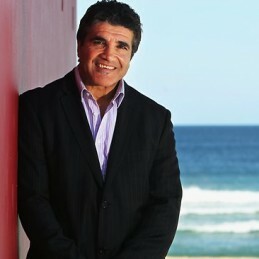 Since retirement, Mario has taken up the role as the NRL’s Sponsorship Manager but has remained well-recognised in the media, perhaps largely due to his recurring role as ‘The Falcon’ on Channel Nine’s Footy Show. With an incredibly diverse fan base that spans three generations, Mario is just as popular with young rugby fans as he is with his playing contemporaries. A captivating storyteller and motivator, Mario is in high demand as a keynote speaker or celebrity guest at corporate events. Mario’s instantly recognisable image combined with his ability to develop rapport with anyone he interacts with has made him incredibly popular. Mario is in particular demand among companies who want to increase the acceptance of their products. In essence, people trust the brands and companies that Mario represents. An ambassador for One Community, Mario is a role model for youth and a non-drinker who has spent his life brushing aside peer pressure. He was a victim of bullying himself and can pass on lessons of how self-respect and self-belief can be used to achieve your goals. Mario spends a lot of time addressing schools, telling his story, and educating students of the importance of a balanced diet, exercise, and a healthy lifestyle. Mario will captivate and leave audiences hanging on every word he says.